Darien senior citizens and/or disabled people who are renters may be eligible for a rent rebate from the State of Connecticut for the year 2016. The program, which is now in progress, will continue through Sept. 31, 2017 at the Darien Human Services Dept. All income, including Social Security (Social Security Form SSA-1099), must be reported and documented. This includes, but not limited to: Pensions, interest on bank accounts, dividends and wages. If a 2016 Federal Income Tax Return was filed, a copy is required. From 5:30 to 7:30 p.m. on Thursday, July 6th in the West Hartford Town Hall Auditorium, U.S. Sen. Richard Blumenthal will convene a fourth emergency field hearing as GOP leaders vow to continue efforts to repeal the Affordable Care Act and strip coverage from millions of Americans. This hearing will be held in the evening to afford more opportunity for individuals to speak. The GOP decision to delay the vote on their cruel and costly bill was a testament to the millions of Americans who stood up and spoke out—including hundreds of people from Connecticut who packed the first two field hearings in Connecticut. Senator Blumenthal has been speaking on the Senate floor every day sharing those powerful and deeply impactful stories. Those messages have been heard around the country and made a difference. But the fight is not over. We cannot be complacent. GOP Senate leadership is continuing to negotiate in secret and plans to ram through a partisan vote after the July 4 recess week. Please come out to show the GOP that we are not giving up until they agree once and for all to preserve and protect our healthcare and stop these cruel efforts to dismantle the Affordable Care Act. Please email Elizabeth_Benton@blumenthal.senate.gov and indicate if you are attending or wish to speak. You can also email written testimony to that address. Participating Aspen Dental practices will provide free dental care to local veterans in Hamden, Meriden, Waterbury, Manchester, Farmington, Torrington, Bristol, and Waterford. Please call 844-ASPEN-HMM to schedule an appointment at a participating office. Appointments are required and available on a first-come, first-served basis. Event flyer here. Article here. This exciting conference features an Interactive Audience Participation Event on “How to Recognize and Prevent Implicit Bias”; a panel on “‘Second Chance’ Programs and How They Relate to Fair Housing”; and a panel on “Invisible Disabilities and Trauma”. If you need more information, please contact Margaret at 203-854-7820. Christian Community Action, Inc. presents “From Compassion to Action: The Road to Hope”, a free and open event about strategies to address underlying and debilitating issues that affect people and families in New Haven. Dr. Matthew Desmond and Juan Salgado, both recipients of the MacArthur Foundation’s Genius Award in 2015, will share their perspectives on this topic. Dr. Desmond, Harvard University sociology professor, is the author of the NY Times bestselling book, Evicted: Poverty and Profit in the American City. Mr. Salgado is the President and CEO of Instituto del Progreso Latino in Chicago, which seeks to assist members of low-income, Latino, or immigrant communities with achieving self-sufficiency and obtaining living wage employment. For more info, please email cca50th@ccahelping.org. Connecticut Mission Of Mercy Dental Clinics are scheduled in New Haven this year. The two-day clinic will provide free dental work to the under-served and the uninsured. Some of the people being treated haven’t been to a dentist in years. This gives them a chance to go and get some much-needed work done that they otherwise couldn’t afford for a number of reasons. More here. When: Friday, April 7 and Saturday, April 8 starting at 6 am. A 38-year-old woman with a spinal cord injury that uses a power wheelchair is able to get health insurance, the opportunity for employment and mobility with a new and improved chair and accessible apartment that lets her get out into the community. A widower living with a mental health disability, who had fallen behind financially after losing his wife is able to get help through the CT Housing Finance Authority and stay in his home. With the support of an advocate for the Money Follows the Person program, a young man living in a nursing facility is able to find a wheelchair accessible apartment that allows him to live in his own home in the community. These are just three of the thousands of individuals across Connecticut who turn to the state’s Independent Living Centers each year for services that provide living skills and support their access to housing, employment, health insurance and medical care. The winter meeting of the Membership of CDR will take place from 6-9 p.m. Thursday, March 23, 2017, at Center for Disability Rights, 369 Highland St., West Haven, CT 06516. There will be a light supper from 6-6:30. Updates and news until 7. A presentation “Living with Wellness,” by Christopher Chase, D.C, SoVita Chiropractic will follow. Please call Carmen 203-934-7077 Ext. 14, or email info@cdr-ct.org to confirm attendance. It is important that we know who is coming so that we can plan on food. We know there has been a lot of news around the president’s Executive Order to Repeal and Replace the ACA or Affordable Care Act (also known as Obamacare). >Did the executive order repeal or replace the ACA? No, it did not. The ACA has not been repealed or replaced at this time. >How does the executive order affect 2017 coverage? It Does Not. The Connecticut Insurance Department assures us that plans that customers enroll in during this Open Enrollment will be honored for the entire year according to state regulation. >Do I still need to enroll? Yes. The law still requires residents to have coverage. >What happens if I don’t enroll? You could pay a tax penalty of $695 or more, and you won’t have coverage for your healthcare needs. >Is there financial help available? Yes. Close to 80% of our members get financial help to pay for their coverage. You have until January 31, 2017 to enroll. Representatives from Greater New Haven Transit, Valley Transit, Milford Transit, CT Dept. 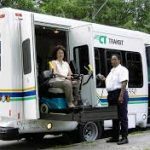 of Transportation Bus System, the Center for Disability Rights and riders, will address issues related to new rules and procedures that will change the way people travel across transit districts at a meeting from 4 to 6 p.m. Tuesday, Sept. 27, 2016, at the offices of the Center for Disability Rights, 369 Highland St., West Haven, 06516. Examples of travel routes that will be discussed include New Haven to Milford; Seymour (and other Valley towns) to West Haven; and New haven to Meriden. RSVP to Charlie Smyth, 203-387-8350, or charliesmyth13@yahoo.com or Irene Puccino, at 203-468-4787.